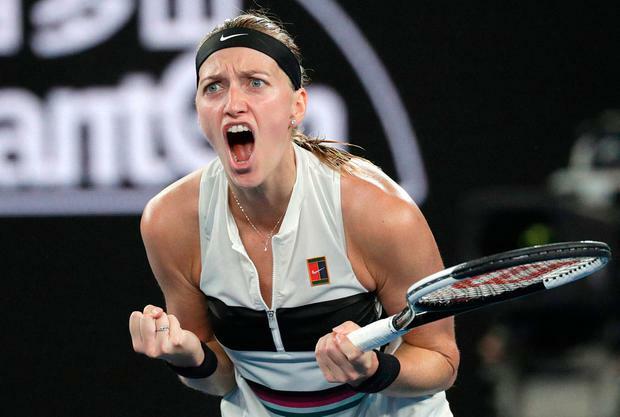 Petra Kvitova surged into the Australian Open final yesterday, closing to within touching distance of the most emotive comeback story in years. Should she clear the last hurdle, expect screenwriters to be working on a script by Monday. It is just over two years since Kvitova suffered serious damage to her racket hand after an armed robber broke into her flat in the Czech Republic. The injury is often described as a stabbing, although, in fact, Kvitova grabbed the blade as it was being held to her throat and yanked it away. Kvitova's surgeon suggested it would be a miracle if she returned to the top of the game. But she started winning lesser tournaments again last spring, and is now on the verge of a third Grand Slam title. And if she wins tomorrow - against reigning US Open champion Naomi Osaka - Kvitova will become world No 1 for the first time. "I think not many people believe that I can do that again - to stand on the court and play tennis on this level," said Kvitova. It might sound like a defiant comment but that was not how she said it. Kvitova is a gentle soul, even if she crushes tennis balls with unmitigated ferocity. "I'm not really believing that I'm in the final," she said. "It's kind of weird that I didn't know even if I was going to play tennis again. It wasn't only physically, mentally it was very tough. "It took me a while to believe in the people around me again, and especially in the men. I wasn't confident to be alone somewhere." The story that most resembles Kvitova's belongs to Monica Seles, the Yugoslavian great who dominated the game at the start of the 1990s, but was then stabbed by a crazed fan who found his way onto the court in 1993. Even though Seles never regained her former ascendancy, she did land one more cathartic Slam title in 1996, here at the Australian Open. "I didn't know that," said Kvitova when the parallel was raised. "But it's nice. In June, I met her (Seles) for the first time. "Actually, she was the one who wanted to meet me, so it was great and a big honour. "I know that it affected her career a lot, especially as it happened on the court. "So, it's a bit different, but it was such a nice feeling to meet someone who kind of went through the same things and thoughts and everything." Kvitova's opponent yesterday, 25-year-old Danielle Collins, produced some magical performances to reach the semi-final and competed well in the first set. But then the roof closed, in line with the new heat rule, and Kvitova went up a level. She dropped only two points in the tie-break, found a new looseness in her racket arm, and sprinted to a 7-6, 6-0 victory. "I think it changed a little bit the rhythm in the match," said Collins, when asked about the switch to indoor tennis. "But that's the decision they made, and she played great tennis. I think that should be the focus of the conversation." It will take a huge effort to keep Kvitova away from the Daphne Akhurst Memorial Cup tomorrow. Her record in finals is phenomenal: 26 wins from 33 attempts, including both her Wimbledon showpieces, in 2011 and 2014. "I love playing on the big stages," she said. But Osaka was exceptional yesterday in her own three-set win over another Czech, Karolina Pliskova. She is on a run of 13 straight Slam victories, after lifting the US Open in September.